The second pick in the 2011 mini draft, Brad Crouch fronted the media on Wednesday to talk about his preseason and the difference from this time last year (LINK HERE). Ben Says: Whilst Brad Crouch, priced at $524,000 in Fantasy & $522,400 in RDT, will head into the 2015 season with relatively low ownership levels, he may well be the find of the season if his trajectory continues in its upward path. Having played only 25 AFL matches, Brad is already scoring 100 or more a solid 44% of the time, ridiculous numbers for someone so early into their AFL career. When you consider that both of his past two seasons came off the back of extremely limited preseasons, those figures become all the more remarkable. Averaging 5.5 tackles a game, Brad is finding points with or without the ball. With his engine being affected by a lack of training, Crouch’s uncontested possessions dropped from 16.2 to 14.2 last season. Add to the fact this also meant he was taking 1.8 less uncontested marks a game, and immediately it’s clear to see where another 10 points per game will come from. Crouch should strongly be considered by all. Michael Whiting was down at the Suns match simulation on Wednesday night and wrote this on Jack Martin (LINK HERE). Ben Says: Without a shadow of a doubt, this is a modern day puff piece and thus must be considered with more than a grain or two of salt. Nevertheless, the key to come out of the Suns camp, in regard to Jack, is his new found weight. Last season it was clear for all to see that Martin was far too slight to make an actual impression on the AFL stage. Within minutes of his Round 1 debut last season, those words proved true as a collision on Martin injured his shoulder which kept him out for half the year. Upon his return he averaged 54.8 points per game. Costing $285,000 in Fantasy & $284,300 in RDT, Martin is a clear and obvious value choice in the forward line, given the expectations. Whilst it all sounds positive, I’d suggest to hold fire on making a decision at this early stage. In 2014, Jack was positioned too close to goals which duly effected his disposal figures, with his best game generating a mere 19 touches. At this point in his career, he may not be best suited to quantity based fantasy games. Watch for his role in the NAB. New Sun’s coach Rodney Eade, spoke to the media on Friday to give an update on the most influential player in the AFL (LINK HERE). Asked whether Gary would make an appearance in the NAB, Eade had this to say. Ben Says: Unfortunately Gary hasn’t had the best preseason of his career, having to deal with the last of the problems brought on by Macaffer’s season ending tackle. Whilst this is unfortunate, the fact that he’s running PB’s in time trials should have many a fantasy coach drooling at the potential prospects. Priced at an average of 119.1, Gaz doesn’t come cheaply but it’ll be a risk for the ages if you decide to bypass the little master. Ablett has a tendency to start with a bang, as these figures suggest. Last season Gary set the ball rolling with an average of 123 over the first 8 (+4 on season average). The season before, he went at an average of 117 over the first 8 (+3 on season average) and before that he went at 131 over the first 2 months (+7 on season average). If you’re planning on upgrading to Gary, don’t expect to get him for a discounted price! North’s #7 Jack Ziebell, spoke to the media last week to give a lowdown on the teams depth in midfield this season and how he’s fortuned after a shoulder clean up in the offseason (LINK HERE). Ben Says: Entering his seventh season of AFL football, Jack will be looking to consistently play at the elite levels that he has managed to produce on an inconsistent basis throughout his career. Priced at $480,000 in Fantasy & $478,400 in RDT, this season Ziebell is forward eligible. After averaging 10 points below the 94 he produced in 2013, there may be some value to his price tag. Once again, his preseason has been far from ideal, but the positive to come from is that Ziebell may actually have improved on his poor engine, given that he has had ample time to give his undivided attention to that part of his game. Averaging a mere 88 minutes per game, if Jack could raise this to an average of 95~, he could potentially eclipse his 2013 campaign. A word of warning though, Ziebell has missed 15 H&A games in the past three seasons and has never played out a full season. Approach with caution, but he certainly has upside. Hawthorn’s general manager of football operations, Chris Fagan, had this to say on Brendan Whitecross’ preseason to date after he continues his return from his second ACL injury (LINK HERE). Ben Says: Hawthorn’s 25 year old rebounding defender has been offered to us at the compelling prices of $258,000 & $221,800 in Fantasy and RDT respectively. You can see my in-depth review of him HERE! From these quotes we know that although Fagan is remaining rather positive, Whitecross has invariably had issues with his troublesome knee and will undoubtedly start slow when he is reintroduced into the fold. At his price, if he’s picked Round 1, it’ll be mightily difficult to bypass. That being said I’m now expecting an introduction a little later on in the season, which may invariably lend itself to more of an early downgrade target. Lets see how he gets on during the NAB before making a final decision. 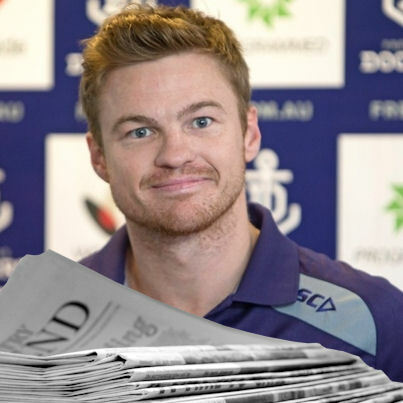 After failing to meet the bare minimum in training standards, Colin Sylvia has been dropped down to Peel Thunder where he must continue on with his preseason training. Chris Bond, General Manager of Football Operations, released this statement to the Dockers website (LINK HERE). Ben Says: Priced at the tempting offers of $163,000 in Fantasy and $184,400 in RDT, Sylvia was a chance to make it into a number of fantasy sides if he could work his way into Lyon’s Round 1 side. Having previously averaged a premium 96.2 in 2010, Colin was bound to make a solid profit if he could get within a mile of those numbers. That has proved not to be the case, as his career falls from one career low to another. Get that red marker out and cross him off the list, because Colin won’t be relevant anytime soon.